This past weekend was a full and crazy weekend – a cake and two family parties. Lots and lots of work, ending with fun (and unfortunately, mosquitos). 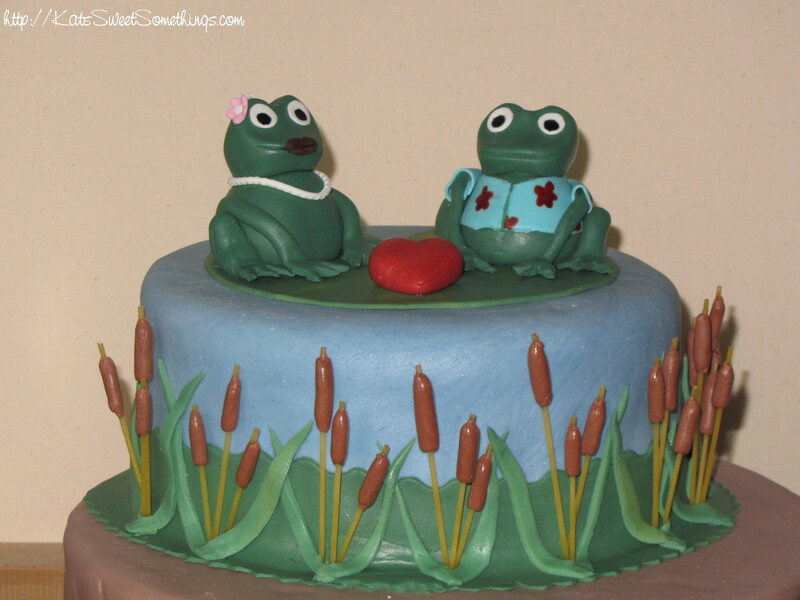 When making this cake for my aunt and uncle, my aunt had mentioned that she liked frogs – so my whole idea of doing something kind of formal with their wedding colors changed completely into a cuter cake idea. Running (or hopping) through my mind were thoughts of frogs and lily pads and cattails. So I got to work doing my usual Google Image research. The frog part was easy – form it out of fondant, just like you would with clay. But I wanted to give some sort of identity to these creatures. Since my uncle tends to wear a lot of Hawaiian shirts, I figured that would work well for one frog. For the other, I wasn’t so sure. I wanted to do a little pearl necklace, but figuring out a way to do that was making me want to chuck the frog across the room after a bit. But then… viola! I took a very thin little snake of fondant and started pinching it with a pair of tweezers. It wasn’t perfect (my tweezers were square edged), but it definitely gave the look I was looking for! Add a couple flowers to the lady frog’s head and it was perfect. As for cattails… I had a fun time trying to figure this out. Eventually I ran across a website in all my searching that said to use spaghetti, but not to do it too early or the spaghetti would get soggy. I decided to try it the morning of the party – roll some little brown fondant sausages, and then pierce it with a little spaghetti stick. I couldn’t BELIEVE how well it worked! For both the blue “water” and the green lily pad, I marbled the fondant. To do this I took two or three different colors and rolled them into snakes. Then I twisted the snakes together and kept doing that over and over again until I got the marbled look I wanted for both pieces. All in all, the cake went very well. This cake was the Double Salted Caramel cake, and while it was difficult to cut after sitting out for so long (the buttercream got very soft), it was absolutely delicious. 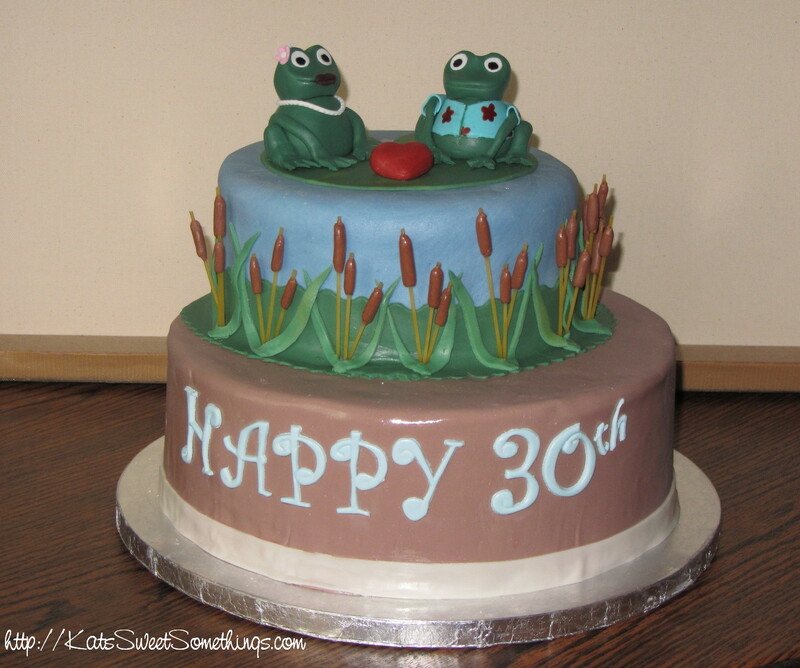 This entry was posted in Cake, Cake Decorations and tagged anniversary cake, fondant cattails, fondant frog, fondant lily pad, frog cake by katj012. Bookmark the permalink. Too bad the fondant frogs didn’t help with the mosquitoes! The thought of you nearly chucking the frog, pearl fondant necklace flying, made me chuckle! This is quite possibly my favorite design you’ve done so far! About how tall are those letters? I think the letters were around 2 or 2.5″ tall – I couldn’t fit two layers of them on the cake with the ribbon, thus the “Happy 30th” instead of “Happy Anniversary”.